WASHINGTON, DC – The Organization of American States (OAS) AMA | Art Museum of the Americas and the Permanent Mission of Peru to the OAS announce Tribute to César Vallejo, an exhibition of drawings and monotypes by Peruvian artist and Gastón Garreaud (1934-2005), to be presented in the Marcus Garvey Hall Of Culture in the OAS Main Building. Garreaud studied in Italy and France between 1956 and 1959, and dedicated part of his life to experimenting in painting three-dimensional shapes using pre-Columbian artifacts (pottery and textiles). This unique style of artistic expression aroused great interest in both his native Peru and abroad, which led to an exhibit of his work at the Corcoran Gallery of Art in Washington, DC in 1966. Throughout his life, Garreaud developed his figurative work in the areas of drawing, engraving, and exploring the monotype technique, which he forged into his own artistic style. 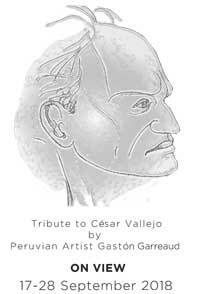 One body of this work was dedicated to the Peruvian poet César Vallejo (Tribute to César Vallejo). One of Garreaud´s drawings from the César Vallejo series was selected for the issue of the commemorative coin and postage stamp marking the centennial of the poet’s birth. In 1975 Garreaud created the iconic series of drawings and monotypes in honor of Cesar Vallejo, and thus a Vallejiana affiliation remained a constant throughout the rest of his life. Born in Lima, Peru to a bourgeois family of French ancestry, Gastón Garreaud was headed to architecture school in Italy by boat when he encountered a painter, who inspired Garreaud to teach himself to paint. Garreud exhibited his work for the first time in 1956 in Rome. Following his three and a half years in Italy, he spent a year in Paris before returning to Peru. His work evolved to embody geometric abstraction, “inspired, in large part, by the geometric forms, clean lines, and three-dimensionality of pre-Columbian artifacts…Reflective of his parallel interests in art and aviation, in the 1980s he produced a series of work that evoked the measuring of volume in terms of aerial architectural views, with influences from the Native Chancay culture of Peru” (Michele Greet, Art of the Americas). Garreaud’s engravings and monotypes of nudes are characterized by their clean and agile strokes creating sensual and playful feminine forms that exude a poetic eroticism. Accessibility: The OAS Main Building is wheelchair accessible by the entrance facing C Street. The building’s elevator leads from the C Street lower level up to the ground floor and into the Marcus Garvey Hall of Culture. For accessibility concerns, please call 202 370 0147 or e-mail artmus@oas.org.